It seems that New York City, which was likely the city in the United States with the most public shelters overall, is starting an official effort to remove some of the signs. This particular article, as well as one from the Huffington Post mention that it is the Department of Education who wants the signs down from their public school buildings; other articles make a generic declaration that city government was beginning to remove all of the signs. These articles actually came out while I was traveling and staying in New York City, and dozens of signs were still seen on not only private buildings (this bank, as well as apartment buildings), but some government buildings and many public housing buildings as well. My guess is that the majority will be removed from public schools while the rest remain on other private and public buildings until they are eventually taken down or the building is demolished. New York is rich in history and these signs are no exception; even if a mass effort to remove the signs began, it would be a long time before all of them were removed. These articles, however, are more proof that the signs are quickly fading into oblivion. It is my goal to chronicle as many of them as possible before they are all taken down and become just a memory of a dark, scary past. On September 28, former Mass College of Art students Karen Loftus and Gretchen Baer premiered their show, Crackatorium Revisited, which was a redux of their original 1983/1984 Civil Defense performance using actual civil defense ration crackers. The original show as well as version 2 used the crackers and civil defense memorabilia to make an abstract show about nuclear war. Gretchen and Karen lived for a time in the basement area of one of the MCOA buildings, which was a designated Fallout Shelter. Gretchen had reached out to Fallout Five Zero for information regarding the shelter and it’s status, and therefore FFZ has chosen to feature this because of the unique idea of using civil defense items in the performance. Although the building in which they lived remains, the Fallout Shelter signs do not, albeit for potentially one, and it’s not visible if it is there. Below are pictures of the creators and a link to a video of the performance. The crackers they used for the redux were not actual Civil Defense issued crackers, but similar survival ration crackers made by the National Biscuit Company, known better to us as Nabisco. The area where the performance took place was dubbed the Crackatorium after the original performance, and is still called that to this day. Pictures and video owned by Gretchen Baer and Karen Loftus and used with permission. Robert Blakeley, the US Army Corps of Engineers employee tasked with creating the very sign this website chronicles, died on Wednesday, October 25 at the age of 95. Mr. Blakeley was tasked as part of his duties to create a sign that would be recognizable, even without power, and with time and creation, the black and yellow Fallout Shelter sign was born. Conelrad Adjacent did an entire interview with him after tracking him down over 10 years ago, and this story can be found here, and is told in great detail. It was important for this site to recognize the man without whom this site would be possible, and although at the time the task was just part of his duties, he would never know how much interest and buzz his sign creates to this day, over 50 years later. We salute you, Mr. Blakeley, and may you Rest In Peace. You are cordially invited to join Karen Loftus and Gretchen Baer for Crackatorium Revisited, a re-hash of their early 1980’s civil defense inspired art show at the Mass College of Art. The show opens on Thursday, September 28th from 6-10pm. In 1984, a group of us at Mass College Of Art in Boston, created the world’s biggest survival cracker loaf obtained from the Mass Art Civil Defense Fallout shelter that also served as our underground studios. We coined the name “Crackatorium” for the gallery above the 924 person fallout shelter where we made the loaf. Join Karen Loftus and I, as we return to Mass Art with “Crackatroium [sic] Revisited”, a two women show about our time in the fallout shelter, nuclear survival, activism now, and of-course, survival crackers. For more information, you can visit their Facebook page here. Crackatorium Revisited, the above poster, and all associated art is property of Karen Loftus and Gretchen Baer and not owned by or associated with Fallout Five Zero. Any views expressed within the show are those of the performers and do not necessarily reflect the views of Fallout Five Zero. As has been seen in previous posts, this website’s mission is to chronicle the public Fallout Shelter in the United States and especially the signs that marked them, as they are being taken down at a steady rate. Sometimes, however, strange things happen. In this 2014 Google Street View image, the restaurant is seen with the Golden Leaf signage still up. To the left of the main door and above the red ramp, an exterior Fallout Shelter sign can be seen. In 2016, they began renovating. In this 2016 Google Street View image, the sign still hangs in it’s original spot. 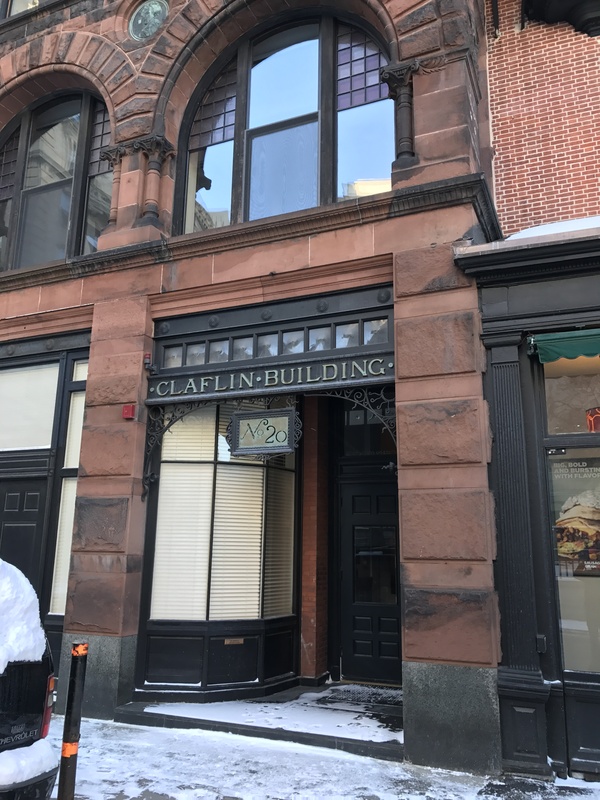 While passing the building yesterday, it appeared that the renovations were complete, and the front facade had been either painted or the brick had been cleaned; as well, the name had been changed to Station KTV Karaoke. The Fallout Shelter sign was also gone, falling victim to time and renovation as they usually do….or so I thought until a second glance showed otherwise. That’s right! The sign was not taken down and trashed, but moved to a different location, over to the left near the new lights above the ramp. Next to the door, the shadow of the original sign can still be seen. And below, the sign itself in it’s new spot. It’s a little worse for wear after being taken down and put back up, but overall it’s still in great shape. There are many theories available as to why those who either renovated the building, or own it, put the sign back up, but my best guess would be that they didn’t know the program was now defunct and they didn’t have to. Either way, it’s a welcome change from the usual removal and destruction (or taking) of the signs and just one minor preservation of history, even for a short time. Google Street View Images owned by Google and taken in 2014 and 2016, respectively. All other photos taken on June 18, 2017 and are property of Fallout Five Zero. 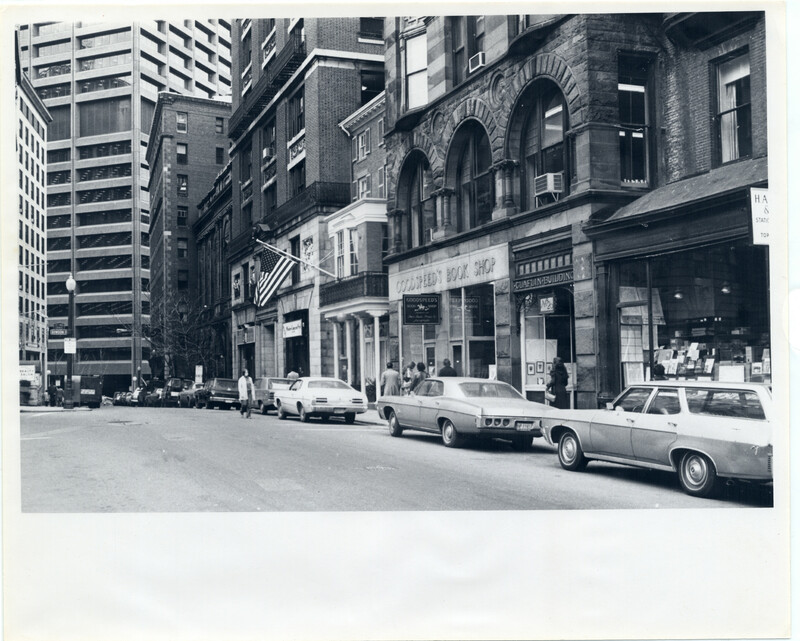 The above photo, owned by the City of Boston Archives, shows the Claflin Building, located at 20 Beacon Street in Boston (seen to the right of the middle of the photo), sometime in the 1970’s or 1980’s. 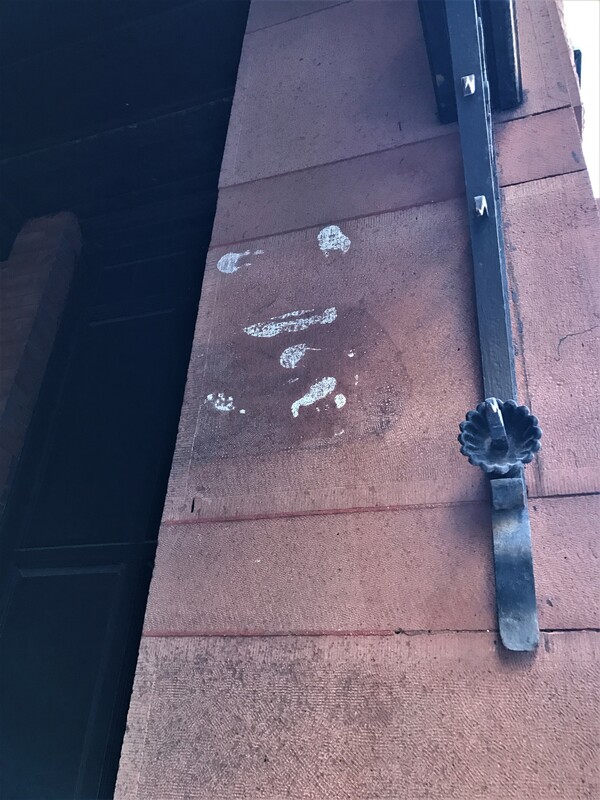 Next to the “Claflin Building” sign, 5 prominent marks from a removed exterior Fallout Shelter sign are seen. doorway to the building, as seen above. The building today is private residences, and was once a great example of how private buildings were licensed and used as public shelters. (This is across from the Massachusetts State House, which became the first public Fallout Shelter in Massachusetts on November 5, 1962). Live or work somewhere you know (or think) was once a shelter? Let us know. Historical photo owned by the City of Boston Archives and used under Creative Commons licensing. No portion of the photo was altered in any way. 3 modern photos owned by Fallout Five Zero. 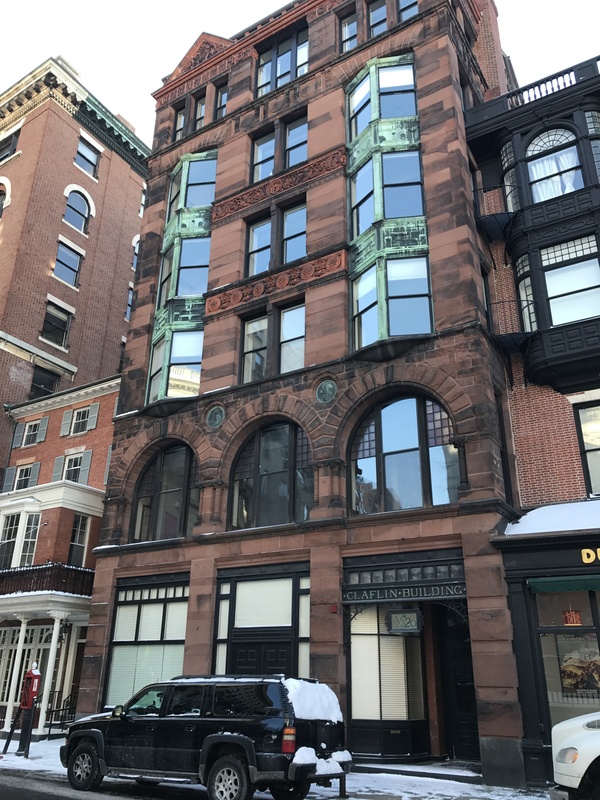 Back in May of 2016, we featured a post called When The Sirens Rang Over Boston, which featured a picture of the former and now non-extant controls of a Federal Signal Air Raid Siren, which were located at Boston Fire Department Engine 51 in Brighton. As stated in the last post, Boston once had an extensive siren network (many of them on top of city fire stations). 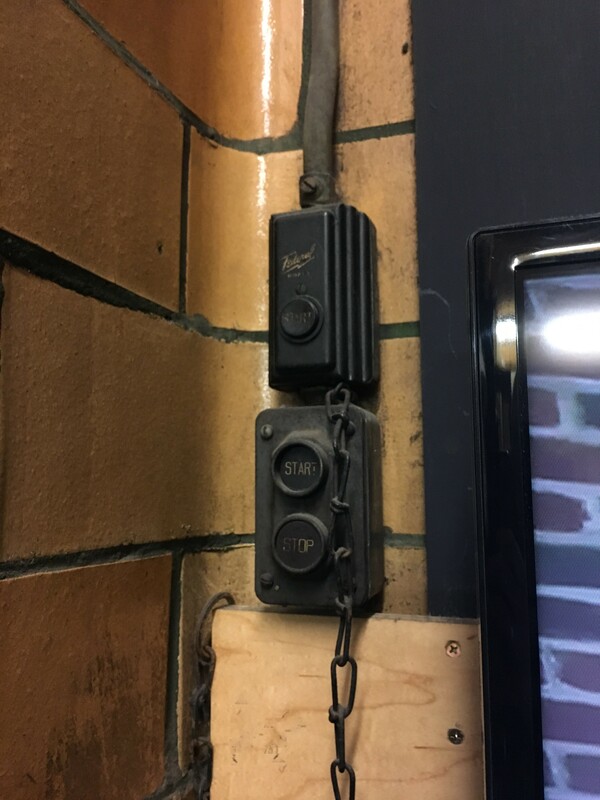 However, it was thought at the time that those were likely the last set of air raid siren controls in the city (or anything having to do with the sirens period, since the last siren itself one came down in 2000). However, here in March of 2017, it was discovered that another set of controls exists at yet another fire station in Brighton (this one is on Chestnut Hill Avenue). Unlike the last set of controls, there is no protective box over these; however, they are the exact same design as the others. Historical photos show the siren still on top of the station into the late 1970’s/early 1980’s, although it is unknown exactly when it came down for good. Either way, it was rare but welcomed to find it’s controls still in place.